I come to your house or you come to mine, which ever is more conveinient for you, for an initial trial. You then show me certain looks you would like for your wedding day either from picturtes you've got from magazines or photos you have saved on your phone. We discuss in detail how those looks would suit you ie: would it suit your colouring, your dress & even the colour theme you have for your wedding. 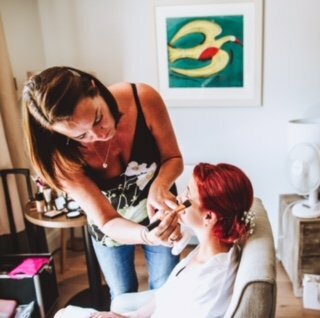 I then do the make-up trial to make sure you are completely satisfied with your final look, if not...we try again! This part of the service is not rushed, as I want you to feel totally confident in the look we have created for you. My aim is to put you at ease throughout the whole process & to make your overall experience less stressful. When we've finished the trial I want to leave you feeling positive that you will look beautiful on your special day. We then arrange a time for the wedding day & I come to your house/hotel & spend the morning with you, staying until you leave for the ceremony. I also do a wedding service for the Mother of the bride & bridesmaids. A trial is not necessary unless requested, but it can be useful regarding what colours suit the individual best.